The "Solar System" is among the "approved subjects" for United States Postal Service (USPS) stamps in 2014, according to a list leaked to the press. Fictional stamp created by collectSPACE.com for article illustration only. The United States Postal Service is planning to put its stamp on the solar system — or rather the solar system on its stamps. The inclusion of the "Solar System" on the list though, is consistent with the minutes from a 2013 meeting leaked to the weekly magazine Linn's Stamp News last May. In that report, the space stamps were targeted for this October. Both the meeting's minutes and subject list originated with the Citizens' Stamps Advisory Committee, a panel tasked with reviewing stamp ideas and making recommendations to the U.S. Postmaster. In the past, the Postal Service announced most of its next year's stamp schedule at once. In recent years, the USPS has chosen to reveal new issues as the year progresses. To date, the USPS has released information about stamps it plans to issue this year through July. No other details about the planetary-themed postage have been made public. The leaked reports do not stipulate how many different stamp designs would comprise the set. If they are released this year, the "Solar System" stamps will be the first U.S. space or astronomy-topical stamps in three years. The solar system is made up of the sun and everything that orbits around it, including planets, moons, asteroids, comets and meteoroids. It extends from the sun, called Sol by the ancient Romans, and goes past the four inner planets, through the Asteroid Belt to the four gas giants and on to the disk-shaped Kuiper Belt and far beyond to the giant, spherical Oort Cloud and the teardrop-shaped heliopause. Scientists estimate that the edge of the solar system is about 9 billion miles (15 billion kilometers) from the sun. Many scientists think our solar system formed from a giant, rotating cloud of gas and dust known as the solar nebula. As the nebula collapsed because of its gravity, it spun faster and flattened into a disk. Most of the material was pulled toward the center to form the sun. Other particles within the disk collided and stuck together to form asteroid-sized objects named as planetesimals, some of which combined to become the asteroids, comets, moons and planets. The solar wind from the sun was so powerful that it swept away most of the lighter elements, such as hydrogen and helium, from the innermost planets, leaving behind mostly small, rocky worlds. The solar wind was much weaker in the outer regions, however, resulting in gas giants made up mostly of hydrogen and helium. I am going to go off topic with this article a little bit but I really feel it is an article worth sharing here, and it is an article that I’ve spent some time doing research, even though the article is a bit long its very much worth the read, so here it is. Our Solar system is made up of the sun and everything that orbits around it; planets, moons, and space rock. Scientists estimate that the edge of our solar system is located around 15 billion kilometers from our Sun; or Sol as the ancient Romans called it. The planets located within our solar system have been the main interest for ancient civilizations throughout thousands of years; who followed them across the sky and recorded their positions, and based every-day life in accordance with the stars. There are many things that few people know about the solar system, in this article we will introduce you further more to the solar system with a few facts, so lets start. 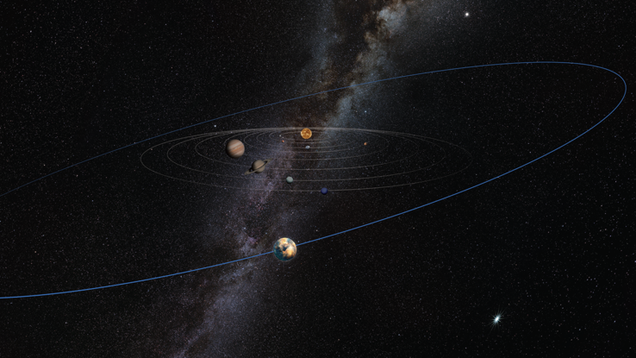 'Vacation Guide to the Solar System': Where Would YOU Go? Olivia Koski and Jana Grcevich want to send everyone to space — on vacation. In "Vacation Guide to the Solar System" (Penguin Books, 2017), the science writer and astronomer team up to take readers through the finer points of a future where a relaxing trip to float in the clouds of Venus is commonplace, and where daring travelers ski on Mercury or skydive on Saturn. Just remember to sign up for years of time off at work! Space.com: So why a solar system vacation guide? Olivia Koski: It all started with something called the Intergalactic Travel Bureau, a pop-up agency where the organization Guerilla Science invites members of the public to come and plan their vacation with an astronomer. Guerilla Science does all kinds of events and performances at festivals — all with the mission to imbue science into culture, so planning vacations to space was an idea that we had to make astronomy and space science relevant to the average person. Guerilla Science had done this in London for the Royal Astronomers' Ball back in 2011, and then in 2012 we brought the Intergalactic Travel Bureau to New York, and recruited Jana as one of our first space travel agents. Jana Grcevich: I was a graduate student in astronomy at the time, and that sounded like a lot of fun — and it was. It's very different from sitting at a computer all day long; I was finishing my thesis, hard at work alone in my room. It's like translating [science] in a way that's far more vivid and interesting. I kind of got caught up with it as well, in doing this — just thinking about what it would be like to go low-gravity hiking, or skiing on Pluto. There are so many different places where you can go and think about the human experience of being there. Koski: As we started talking to people about what they want to do on vacation, we realized that there was definitely the need for a guide to vacationing in space … It just felt like doing the book would be a natural extension of the experience. It’s been about 11 years since Pluto was demoted to dwarf planet status, leaving a 1,473 mile (2,370 kilometers)-size void in our hearts. Since then, the hunt for Planet X—aptly renamed Planet 9—has grown into an international movement to find such an object in the Kuiper Belt beyond Neptune’s orbit. Now, scientists Kat Volk and Renu Malhotra from the University of Arizona’s Lunar and Planetary Laboratory are upping the ante—they suggest that a completely different, tenth planetary-mass object is hiding somewhere in the Kuiper Belt as well. Is someone keeping track of all these *bleep* hypothetical planets? Here’s what we know about this undiscovered, maybe-planet: According to the researchers’ work, which has been published in the Astronomical Journal, this so-called “Planet 10" would be located at about 55 astronomical units (AU), if it’s real. That’s significantly closer than the estimated location of Planet 9, which is thought to be in the Kuiper Belt as well, but at about 700 AU. The team posits Planet 10's mass is somewhere between Mars’ and Earth’s, which they determined by studying the orbital tilts of roughly 600 icy bodies in the region, known as Kepler Belt Objects (KBOs). KBOs orbit the Sun at an incline that’s different from the eight known planets in our solar system, but according to the researchers’ calculations, the orbital tilts of these particular KBOs were so unusual that something else would have to be at work. The researchers assert the gravitational tug of a tenth planet with roughly the mass of Mars could be responsible for their unusual orbital plane. While we’d all love to ride the Planet 10 hype train, Caltech astronomer Konstantin Batygin—who co-authored a paper last year proposing the existence of Planet 9—says we should pump the breaks, at least for now. Hope you do not mind Auntym. I could not find a place to stick this. Could not find Nasa. Sounds from our solar system. I'm sure this has been here before. Somewhere!! but it was one planet at a time as they would do by where voyager was at the time. Diagram showing the bubbles created by the force of solar winds and galactic rays. Like most scientific findings, the team is quick to say that it is not confirmed yet. They say there’s a chance that the increased light may not be coming from the hydrogen wall, but might be another, as of yet unknown, source in interstellar space. They say that the telltale sign will be whether or not the New Horizons probe keeps detecting light after it passes where the wall should be. If it stops detecting light, then it means that it was actually detecting the wall. If the readings remain the same, then it has to be something else. it takes a long time to do things in space, and it will likely take another 10 years before they can know for sure. Luckily, the instrument known as Alice that New Horizons is outfitted with has enough power to be operational for another 15 to 20 years. It’s only fitting that the giant ball of fire responsible for all life keeps a nice little bubble around its children. Unfortunately, its a bubble that only stops very small things. The object named Oumuamua broke through it not so long ago, and one day something bigger is going to crash through like the Kool-Aid man on a bender and it’ll be game over. Thanks for nothing, sun.